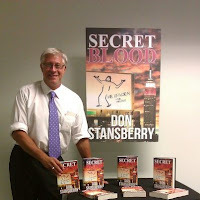 Local author Don Stansberry has released his first novel, "Secret Blood", and is having a book release reception June 30 at the Vienna Public Library. The reception will be from 2 - 4 pm in the meeting room at the library at 2300 River Road, Vienna. Stansberry is an award-winning author and "Secret Blood" is his first novel. The book is about cloning Jesus.